Summary: After the Sandy’s father dies of cancer, Sandy is left with her mother, the usually absent part of their little family. Drowning in grief and depression, Sandy begins to pull away from school and her friends, isolating herself in her misery until she reaches her breaking point when she finds out some startling news from her mother. Sandy’s best friend Lennie does her best to reach her and support her through the grieving process, but when Lennie’s mother’s brother shows up in town, a lot of family issues come to the surface. Suddenly there’s an explanation for why Lennie’s mother goes through man after man from the bar, and why she has never mentioned her family before. Both girls have complicated mother/daughter relationships, and learning to open up and talk things through won’t be easy for either family. On Sandy’s part though, it has to begin with a decision to go on living. 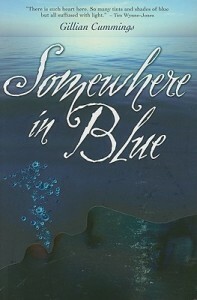 Review: The first time I read Somewhere in Blue by Gillian Cummings, I thought it was about a girl named Sandy grieving the death of her father. Reading the same book for the second time today showed me that it was so much more than that. First of all, it’s beautifully written. Cummings’ writing reads like poetry with memorable imagery and prose that flows like water. It’s one of those rare books where I wholeheartedly agreed with the comment on the cover. Author Tim Wynne-Jones writes: “There is such heart here. So many tints and shades of blue but all suffused with light.” I’ve included several memorable quotes so you can read and experience Cummings’ writing for yourself. At times, it is breath-taking. Second, Somewhere in Blue is about family. Both Sandy and Lennie have complicated relationships with their mothers; one seems to be trying too hard and one doesn’t seem to be trying enough. In both cases, communication is the key to understanding, but it’s a difficult thing to achieve when there are secrets in each family and powerful emotions that are hard to discuss. While I still have reservations about Vivian, I loved reading about Lennie and Teresa, her mother as their relationship deepened and they realised they were on the same side. They were both there for each other when they need it the most. And third, the story is about more than just Sandy’s grief reaction to her father’s death. It’s about her mother’s reaction. It’s about Lennie feeling the loss of the family she’s never known. And it’s about Theresa having to face the truth of her childhood, grieving the tragedy that befell her, and the secrets that everyone kept that prevented it from ending. If I had a list of my top five favourite literary boyfriends, Dan would be on it. The literal boy-next-door, he is always there for Sandy, trying to support her and bring her out of her depression. What I liked best was that even when he realised he couldn’t pull Sandy out of her depression, he still stood by her. Not to talk, but just to provide a physical presence of comfort. Dan’s willingness to do so was more meaningful to Sandy than the interventions others tried to stage for her. As Sandy sinks deeper and deeper into grief and depression, she finally reaches her breaking point in a nail-biting moment when readers aren’t quite sure if Sandy wants to live or not. But my favourite part was that she did end up making a decision, and it wasn’t because anyone rescued her, she did it for herself. Once she had made her choice, her friends were immediately there to support her and everything gets just a little bit better with more change and improvement to come. One more thing, and then I will promise I will stop gushing. I love the use of the quotes Cummings includes by Robert Frost. Frost writes that when one is dying, they take a journey that others can’t accompany them on. I think he’s right, there is a certain point where the journey must be made alone, but until that point, the comfort of friends and family is essential, even if there is a bit of distance between the two. I’m glad Sandy realises that she did accompany her father as far as she could, because I’m confident he appreciated all of her love and care. I love this book and it is one of my all-time favourites because it is a thoughtful exploration of overwhelming grief with well-drawn, vibrant characters. 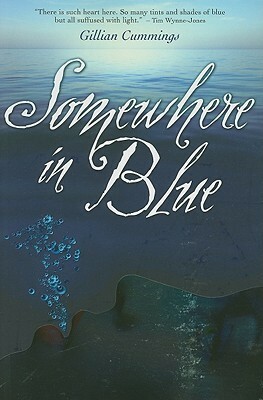 Somewhere in Blue by Gillian Cummings is published by Lobster Press, (2009).